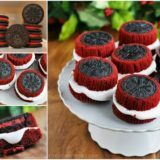 When it comes to changing over our seasonal decor, we wish for than almost anything that we had the time, space, and taste level to do a complete overhaul of all our different pieces as the seasons change. 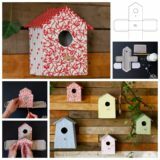 We really are such crafty home decor enthusiasts that we’d simply adore the chance to create a whole new space with a whole new scheme each time a new holiday passed! 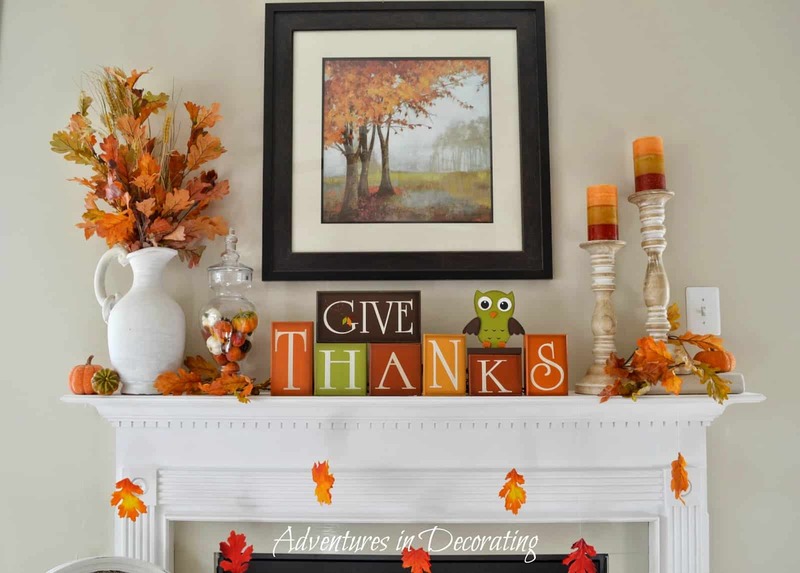 That’s not realistic for how busy our lives are, however, so instead, we focus our decor obsessed attention on one particular and more manageable area: the mantel. 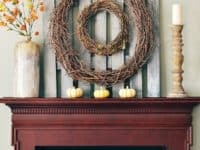 Just in case you’re as obsessed with the idea of creating new fall decor pieces for your mantel, or perhaps even overhauling the whole mantel piece as a fully themed area, as we are, if not more, here are 15 of the very best and most unique designs that we’ve come across so far in our search! 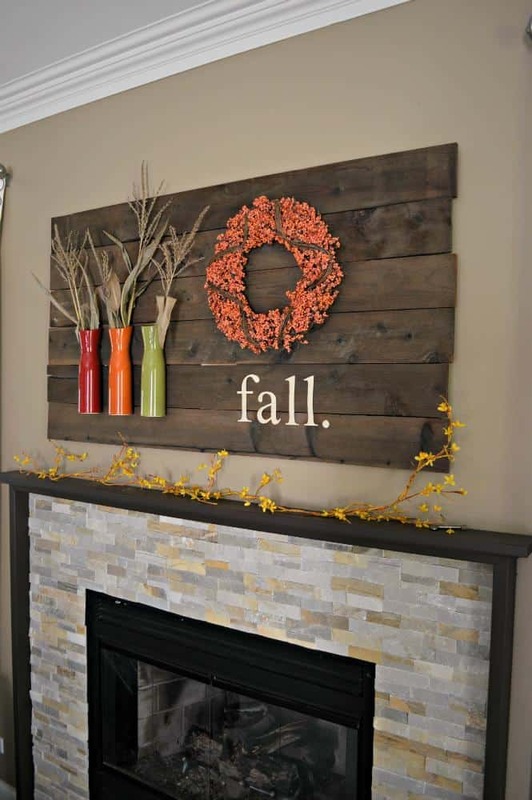 If you’re going to put time and effort into a lovely fall inspired mantel area, would you actually also prefer to make it a beautiful opportunity for upcylcing as well, since that’s usually your favourite kind of DIY project? 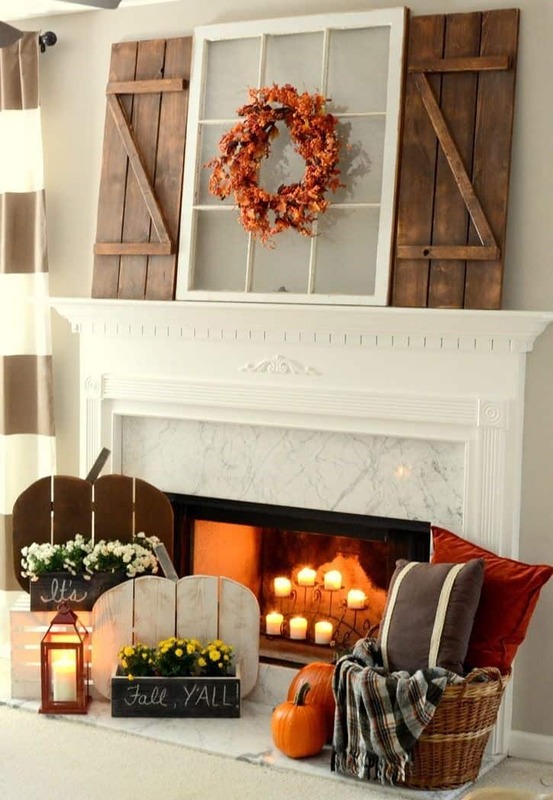 In that case, we’d absolutely suggest taking a look at how The Frugal Homemaker repurposed an old, weathered window frame and set of shutters to set the scene for the mantel to be a little outdoorsy looking fall spot, complete with an orange wreath and some pumpkins. 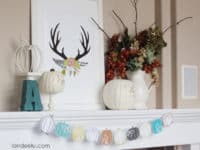 Have you always really loved the way letter, quote, and monogram art all look, with their simple appeal and fun possibilities for stencilling? 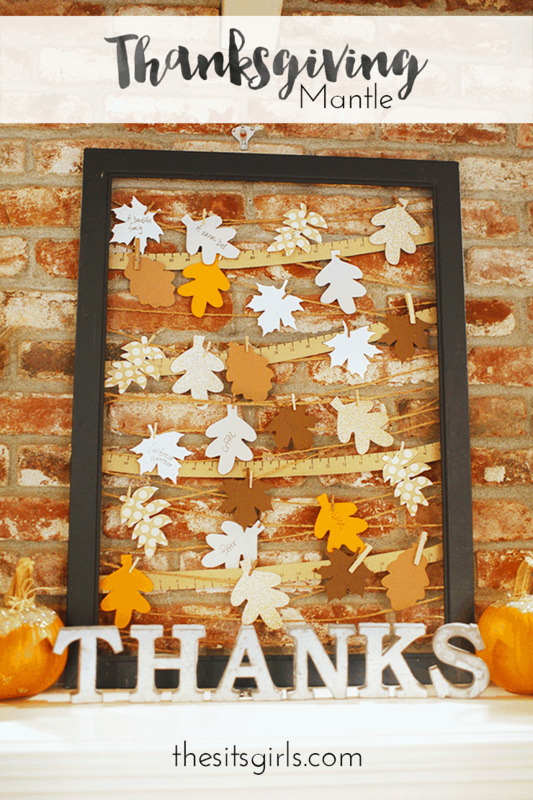 In that case, we have a feeling you’re going to get along very well indeed with these fantastic fall and Thanksgiving block letters featured on Adventures in Decorating! Once you’ve got them painted in autumn colours and stencilled (or freehand painted, if you’re confident in your skills), arrange them to spell out the heartwarming fall message of your choice. 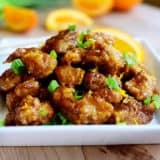 Have you actually always been one of those unique fall decor lovers who adores autumn and making over your home with fall themed projects, but you don’t necessarily feel the need to cover every little inch of your home in red, orange, and yellow colour schemes exclusively? 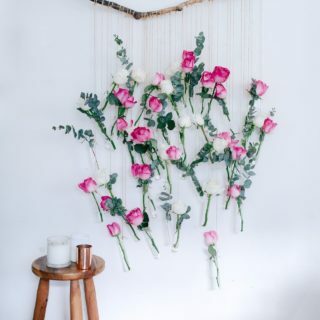 Then we have a feeling this much lighter aesthetic mental featured on House of Joyful Noise might be right up your alley! 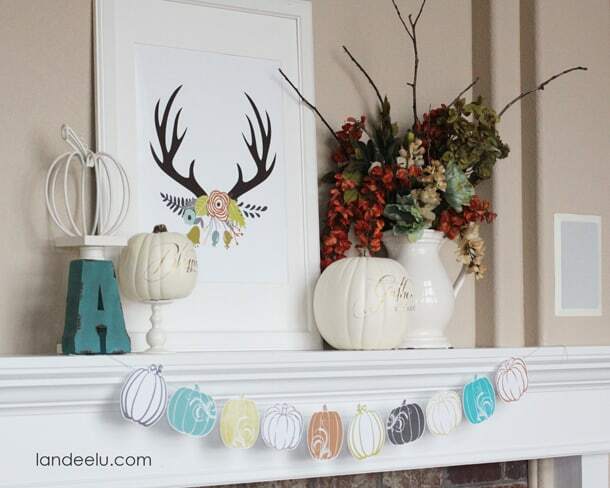 We can’t get over how much we adore the white painted pumpkins; the whole display just looks so clean. 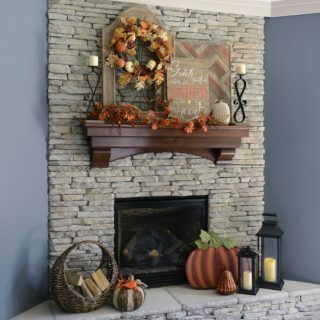 What if you have the kind of mantel that is nearly flush against the wall, leaving you with essentially no platform on which to places things even though you love the look of a decorated fireplace area and the centrality of it in your house so much that you feel determined to overhaul the space anyways? 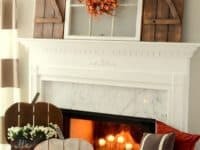 Then we think the way BHG mounted a wreath and some dried branch vases right onto a repurposed wooden backing, mounting that onto the wall above the fireplace in turn, might just be the perfect project for you. 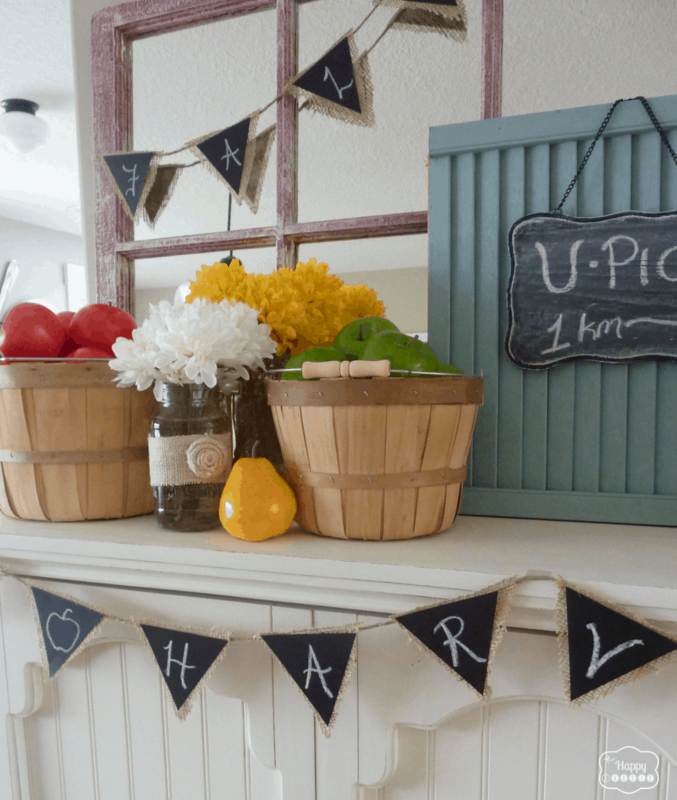 We’ve always loved making homemade garlands and buntings no matter the time of year, but we’ve noticed that our kids particularly love the chalkboard bunting idea you see here because they can help you change the message on the little flags to a new seasonal greeting periodically! 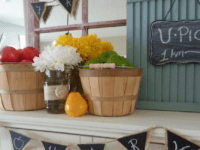 We also appreciate the way The Happy Housie balanced the aesthetic of the burlap in the bunting with similarly coloured harvest fruit baskets placed above, as though your mantel is the site of a recent fall apple harvest. Has your favourite fall aesthetic always been that sort of down home, stylishly worn look, as though the things you’ve created were once very grand but have survived a few seasons until they developed a slightly more minimal character, kind of the way the trees do before winter comes? 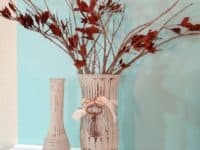 In that case, we think you’ll adore this weathered paint and dried leaf case outlined step by step on Fox Hollow Cottage! 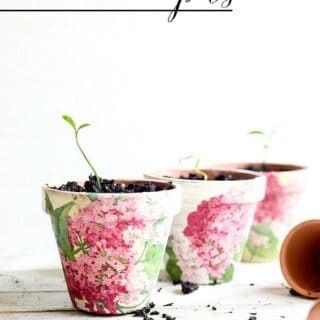 We actually made something similar to this and we made sure to fill the vases with real branches full of dried leaves because we think they smell pleasant. 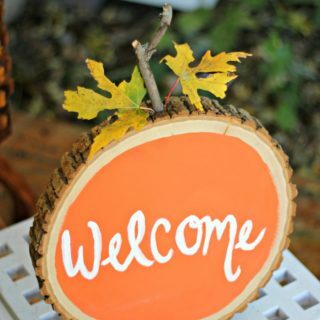 This fantastic tutorial featured in detail on Tierra Este is one of our fall favourites because it’s two fold; you’ll learn how to make both the gathered fabric pumpkins with the cinnamon stick stems and the rolled paper wreath that looks wonderfully rustic chic by the time it’s finished! 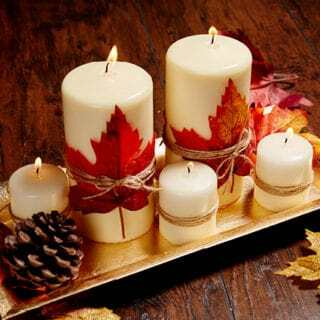 We love the way the pumpkins help the whole house smell more like fall by subtly providing a cinnamon scent throughout the room. 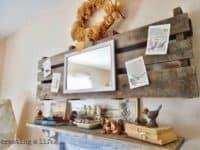 Did we really catch your eye when we started talking about ways to repurpose outdoor housewares in order to make a rustic chic mantel setup but you don’t currently have an entire window frame and shutter set at your disposal for crafting purposes? 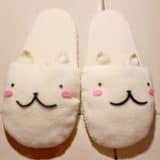 Well, we can’t say we’re surprised, as most people don’t, but we would encourage you to take a look around for an old section of wooden fencing instead. 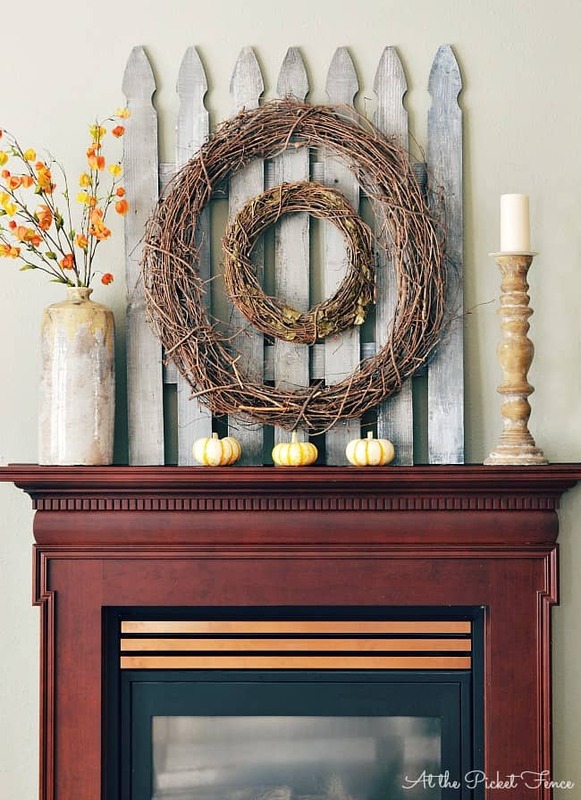 Then you can make this fantastic fencepost and branch wreath DIY mantel project as outlined on The Crazy Craft Lady! 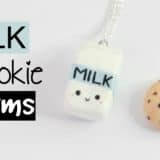 Have you actually been scrolling through our list hoping to find an idea that your kids can help you with, since they nearly always want to help you out in some capacity when you’re crafting, even if what you’re making isn’t really a kid-friendly project? 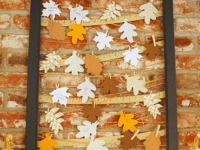 Then we’d definitely suggest taking a look at how The Sits Girls made this framed leaf clothesline, letting their kids cut leaf shapes out of paper and clip the, to the strings, writing things they’re thankful for this season on them. 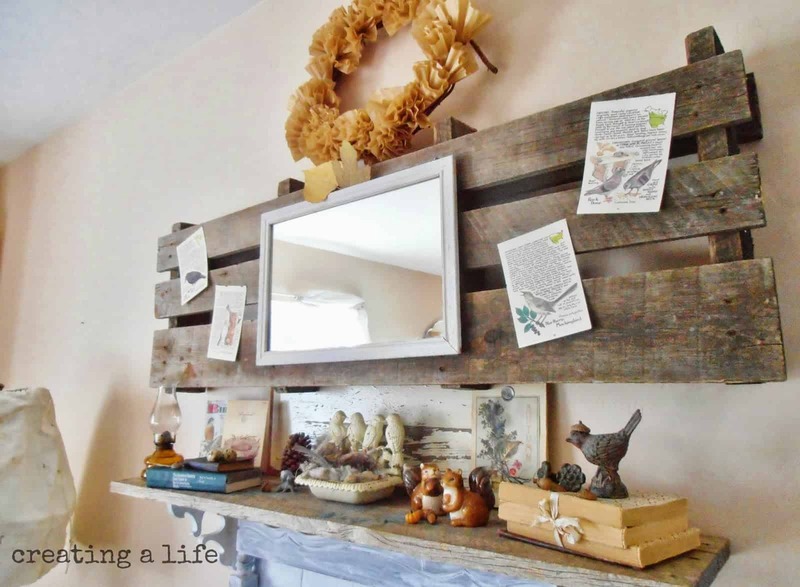 Were you a pretty big fan of the wood mounted idea we showed you earlier, whether you have an actual mantel or not, but you’ve also been really obsessed with upcycled pallet projects specifically lately? 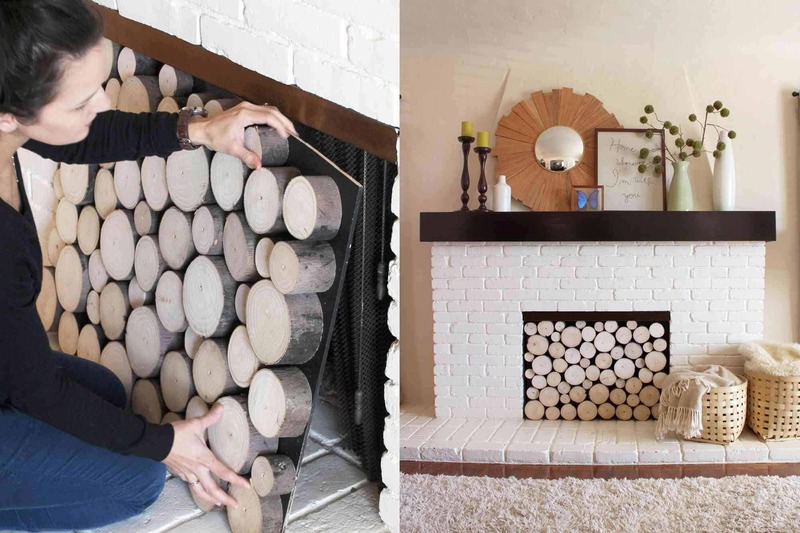 Well, we think you’ll be pleased to learn that you can definitely create a similar effect with a piece of wooden pallet. 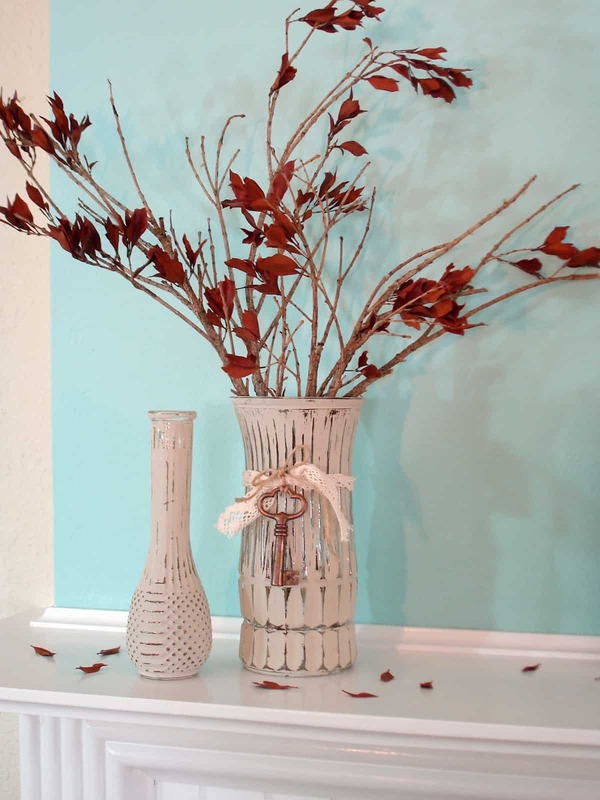 We love the way Creating A Life decorated their mounted wood quite simply by affixing a mirror in the centre and finding old pages from damaged books that profile autumn birds, hanging them on either side of the mirror for seasonal effect. 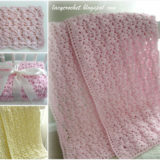 Your visitors might even learn something by reading the pages! 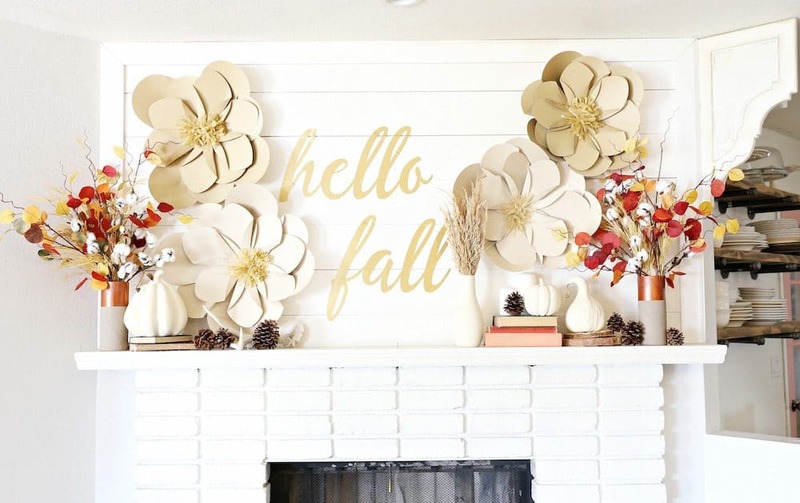 If you’re going to create a mantel backing from repurposed wood, would you rather also use that as an opportunity for practicing your stencilling (or even your freehand lettering) in order to make a lovely quote piece that will help you welcome chillier seasons into your home with open arms? 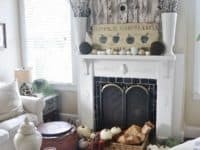 Then we’d absolutely suggest taking a look at how Classy Clutter made this wonderfully fresh and tidy looking piece using a stark white and metallic gold colour scheme. 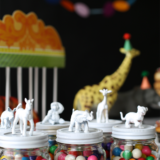 We’ve always loved the concept of making lanterns, particularly in colder seasons because darkness stays longer in the mornings and comes earlier in the evenings, but we’ve never actually enjoyed the idea of including an actual lit flame in our lanterns because we have both kids and pets. 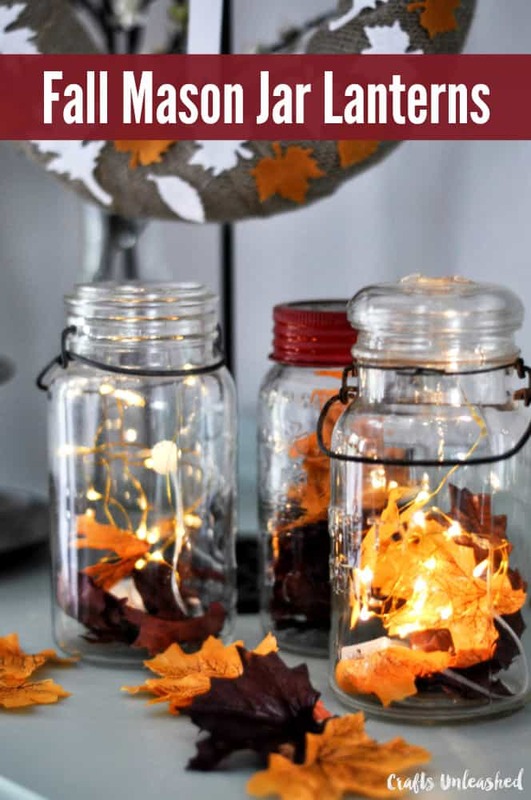 We’re sure you can imagine just how pleased we were, then, when we came across this fantastic mason jar fall lantern idea that is lit using battery powered twinkle lights instead! 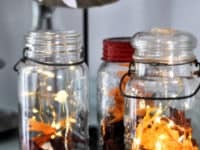 Check out how Crafts Unleashed filled their jars with dried or fabric leaves to hide the battery pack and cords, letting the lights glow through perfectly. 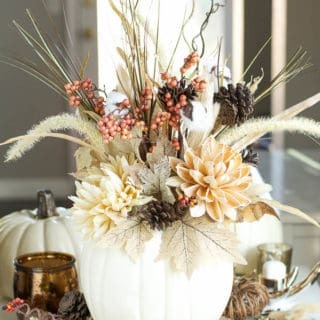 Did we really catch your attention quite well when we started talking about filling glass jars with fall themed things in order to transform them because that’s a perfect way to temporarily customize your pair of big vases for the season without making them unusable the rest of the year? 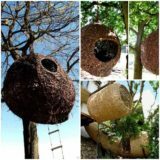 Well, as much as we do love the lantern idea we just outlined, here’s another alternative just to make sure you have lots of options to consider! 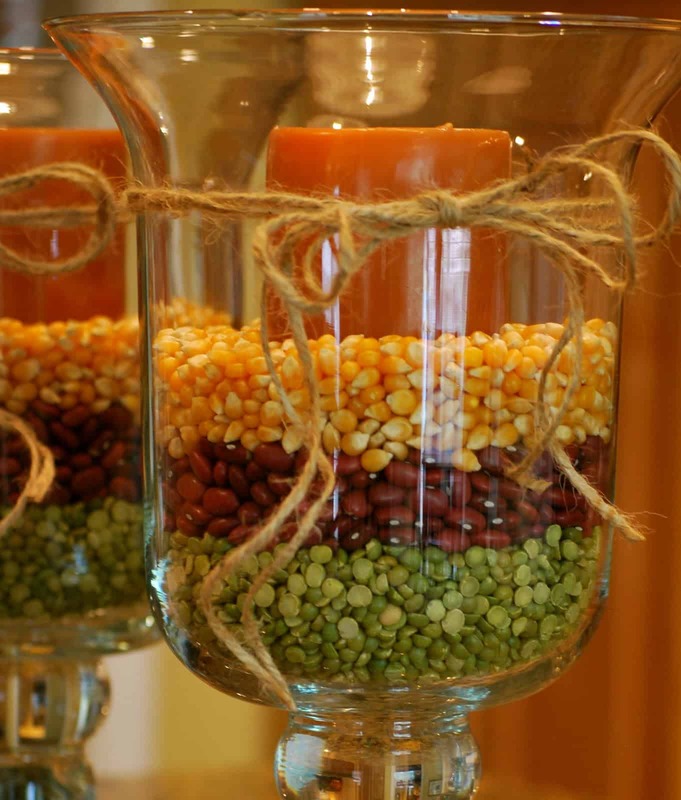 Check out how Amanda Jane Brown filled theirs with layers of lentils and dried corn, nestling a big candle in the centre of each. 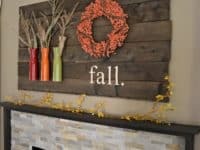 Have you actually been thinking about finding a DIY way to fill the opening of the fireplace beneath your mantel in a way that would fit nicely with a fall aesthetic, but also look good the rest of the year as well, just in case you decide not to swap it out? 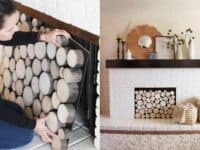 In that case, we’d absolutely suggest taking a look at how Pepper Design created this cut branch sections board that has been carefully measured so it fits right into that space, making it look like you’ve got plenty of logs piled up to keep you warm through the winter. 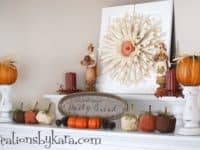 If you’re going to make a fall mantel, would you prefer to make one rather large statement piece instead of piecing an aesthetic scene together little by little using smaller projects? 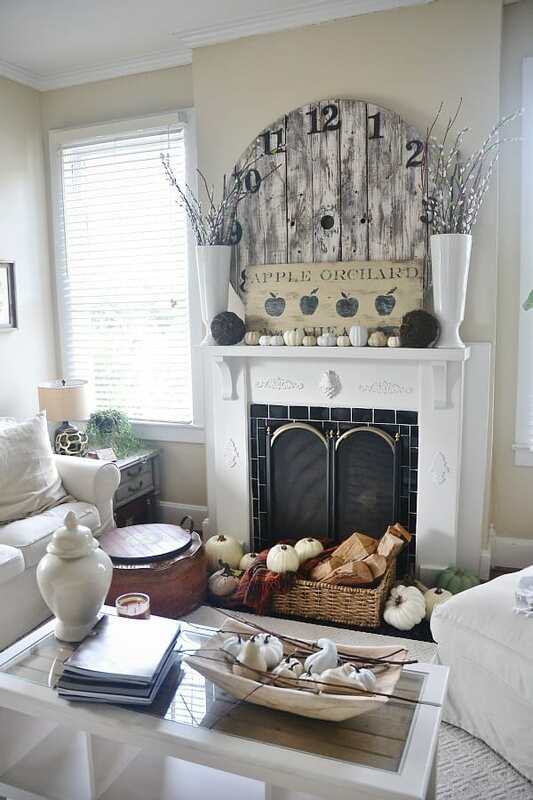 Well, if rustic chic appearance have ever been your thing, then we’d definitely suggest looking at how Liz Marie upcycled the bottom of a large, wooden barrel and created a wonderful DIY clock piece to prop against the wall in a grand, weathered sort of way.